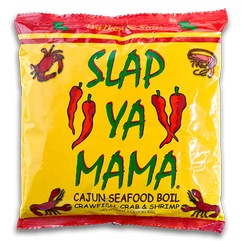 Slap Ya Mama Seafood Boil is a unique blend of spices that will add that great Cajun flavor to any boiled seafood. Just pour in and boil. Each bag will season 40-50lbs. of crawfish or shrimp, or 4-5 dozen crabs. It may also be used to boil lobsters, onions, sausage, potatoes, mushrooms, corn on the cob and much more. Contains NO MSG. Purchase in bulk to save 10%!